1.Wash n Soak the toor dal for 1 hr. 2.Put a pan on flame,add oil and let it heat,when the oil is hot add cumin seeds, crushed garlic pods n fry till garlic smeels good and turn light gold color. 3.Now add curry leaves and red chillies,fry them. 4.Add the soaked toor dal to the pan and fry it for 2 mins. 5.Now add the rice to this toor dal mixture,add salt as per ur taste and pour water. 6.Check for the seasonings.If requried adjust them. 7.Shift the whole mixture to rice cooker and cook it. 8.When the rice is done serve it hot with mango pickle or thick curds. If u want the rice to be mashy u can add more amount of water. 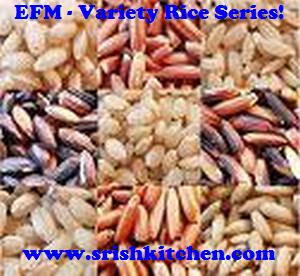 Sharing this recipe with Me and My Kitchen for the event EFM-Variety Rice Series. an ideal dish when ladies feel lazy to cook..